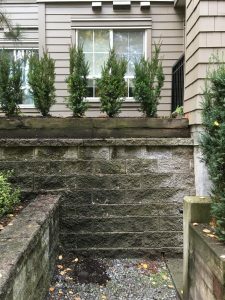 November 2017 - Proper Landscaping Inc.
We already know from my recent blog posts that fall is a great time for landscape installation projects. Cooler temperatures and moisture in the fall are good for plants; and the fall is a bit slower once we get over the maximum leaf drop on our sites and in our gardens. Privacy is a common problem. New owners move into their unit just as we remove dead cedars (Thuja occidentalis ‘Smaragd‘). Now their windows are exposed just above a walkway and we have a problem. The husband is a nice guy but the wife can compose letters to strata that would make a construction worker blush. So a quote is submitted to strata council and approved quickly so the problem goes away. I was the lucky installer on a sunny fall day. It just so happened that the site was a challenge. It’s not perfect cover for windows yet but give it some time. The heat waves our landscapes have been subjected to in recent summers have been hard on our cedar hedges. Most strata owners are too busy to water their plants and regular weekly landscape work visits don’t allow for watering. Thus, the switch to yews (Taxus x media ‘Hicksii’) which are considered hardier. They make nice hedges and sport red berries. 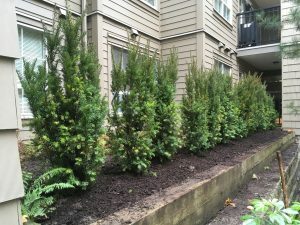 But they are more expensive than cedars so it’s a strain on strata budgets when many cedars die. I got a bit sweaty walking the thirteen potted specimens up the back walkway and I loved it. It served as training. Access is another common hassle. Same for soil conditions. 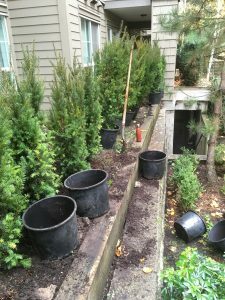 Since the soil closest to the edge was mostly clay, I was forced to off-set the yew row just a bit. Not that it’s a huge problem. The soil was very wet and I had to be careful with irrigation pipes. Another challenge was soil volume. As soon as stuck my shovel in, I hit landscape fabric. Not good. I had to make adjustments. Not the best conditions: soggy soil, clay edge, ledge and low soil volume. One adjustment involved removing the yews from their pots and cleaning off soil from the bottom of the root balls. This allowed me to plant the yews in their somewhat shallow planting holes. Also, don’t forget to rough-up the roots before planting so they stop circling. The second adjustment involved moving in some soil. There were at least two specimens with exposed root balls so the extra soil levelled everything off nicely. Remember, when backfilling your planting holes, always use the existing soil. A very common mistake is backfilling planting holes with new soil. It looks great but water will find it easier to move into the new soil. It will then cause soil saturation and your yew will turn into a joystick. Who knows which way it will fall? Remember the soil we cleaned off from the bottom of the root balls? I saved it and used it to top-dress the finished yew line. It gave it a nicer look. 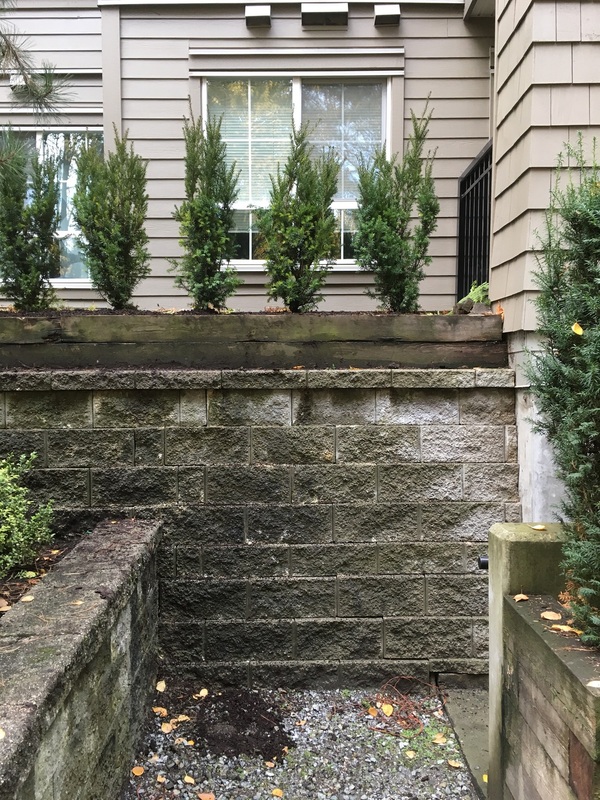 One last step: blow off the muddy ledge below the yews. Always clean-up as best as you can. Weekend rain will water the yews in nicely. I wish them well. I always feel responsible for the health of my plantings. This is a nice change from brown cedars. I hope all of these yews survive and thrive. The European chafer beetle problem isn’t going away anytime soon. 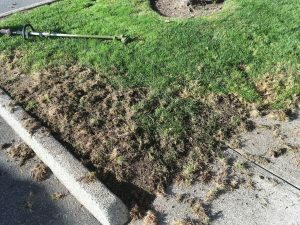 We are seeing a lot of damaged lawns right now in the Tri-cities area where I live. So much damage, it even enters the conversation on soccer field sidelines. Many of the soccer parents are clearly frustrated with the damaged look of their lawns. Otherwise they would be discussing their sons’ performances on the pitch. A familiar sight after birds and animals dig for grubs. I don’t have any good news for you. It’s fall and if your lawn is damaged by birds and animals digging for grubs there is very little you can do. Once the grubs are eaten you should fix your damaged lawn. Simply rake out the damaged spots and install a light layer of turf blend soil. Then rake it into the lawn. 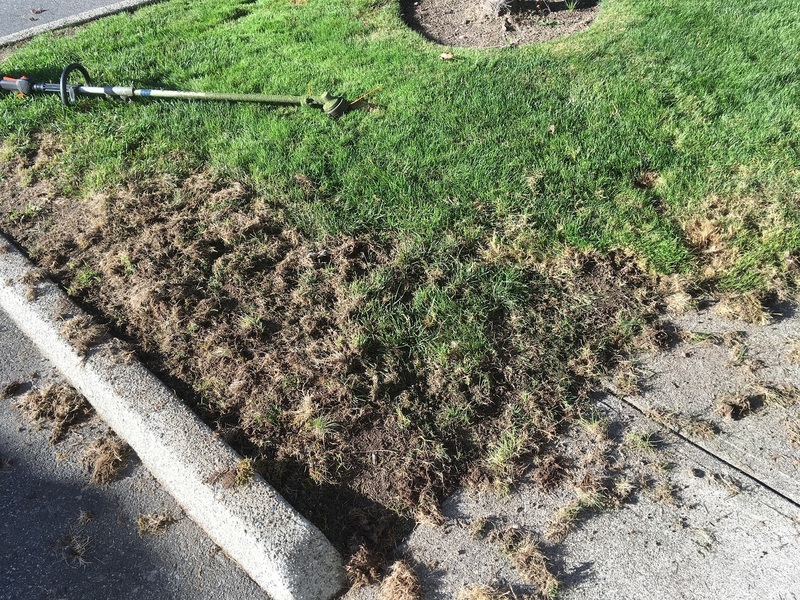 My City of Port Moody handout on chafer beetles suggests covering up the damaged lawn spots to deter further damage from animals. November is a bit late for applying grass seed because there isn’t enough sunlight for grass seed to germinate. Wait for spring when daytime temperatures shoot up. One thing you could do now is apply winter fertilizer to your lawn for strong roots. If your lawn wasn’t aerated in spring you could do that now before the ground gets really cold and stiff. Core aeration allows more oxygen and water to reach the root zone. In spring 2018 you should start caring for your lawn or hire professionals to do it for you. Municipalities have their own handouts on chafer beetles so pick one up where you live and follow the steps. Aeration is a good idea again in spring. I know it takes effort and costs money but fixing your damaged lawn areas will make you happier. Rake everything over and put down more turf blend soil. Rake it in and overseed once temperatures go up. You can pre-order nematodes for late summer application in spring. I have a private client who applied them in 2016 but declined the service in 2017. As of right now, November 2017, his lawn is fine. Only his neighbour’s uncared for lawn has chafers. This is an interesting case because the recommendation is to apply nematodes every year. I know, more bad news. But if you need help, I can come help you apply it the first time. Once you’re trained, you can do it yourself. Or just follow the directions; and check my previous blogs on chafer beetle battles. Read my previous blog on nematode application. You can also consider alternatives. Yesterday I was blown away by a lawn in Port Coquitlam. 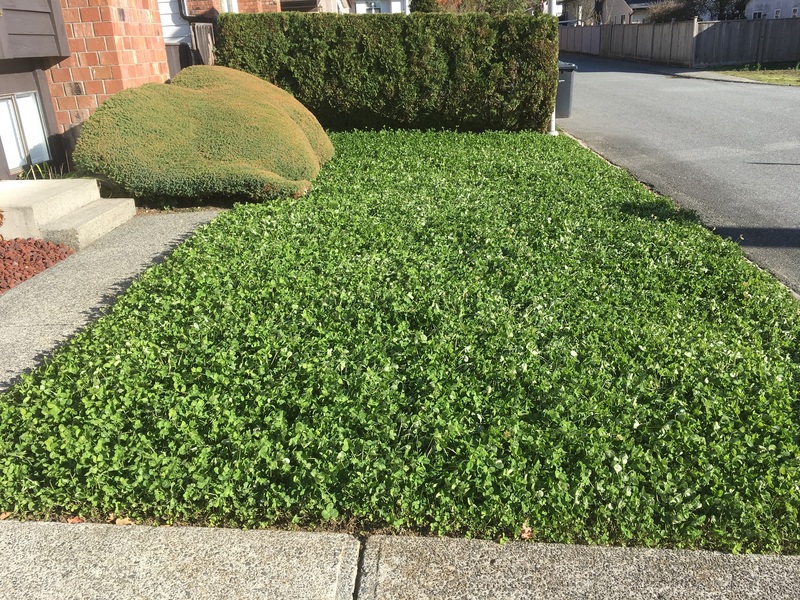 The owners planted their front lawn in clover. 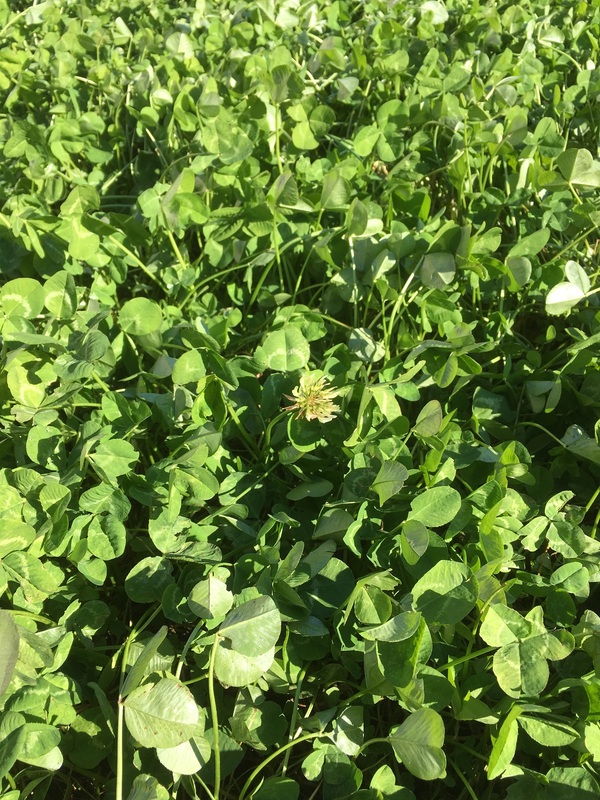 Actual clover, not the micro version that’s mixed in with seed and sold as anti-chafer mix. For a hefty price, too. 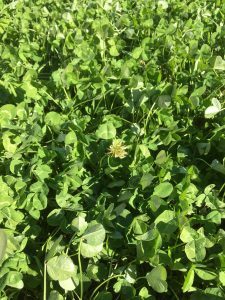 Clover will attract bees and other insects and chafers don’t care for clover. I think when it’s nicely edged, it looks good. There are other ideas so spend the winter thinking about it. You can also read some of my previous blogs on lawn alternatives. Front lawn planted in clover and nicely edged. I love it and so will the insects in summer. Goodbye chafers. No action is required for your lawn in December. The way it’s been going, it will be covered by snow anyway. So just enjoy the holidays. Fall is here and the colours in the landscape are amazing. 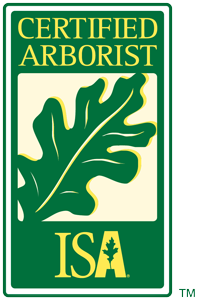 But it’s also busy time for landscape maintenance companies because all sites are getting leafy. So let’s go over some important tips before panic sets in. You can have a smooth fall season if you do things right. Pyramids belong in Egypt. I see this every year: eager and some not so eager new landscapers rake leaves into beautiful leaf pyramids as if it was a contest. But it isn’t. Remember our objective: we need the leaves loaded on our truck and quickly. And how do we accomplish it? By raking onto tarps from the get-go. All raking movement should be pushing leaves onto tarps. 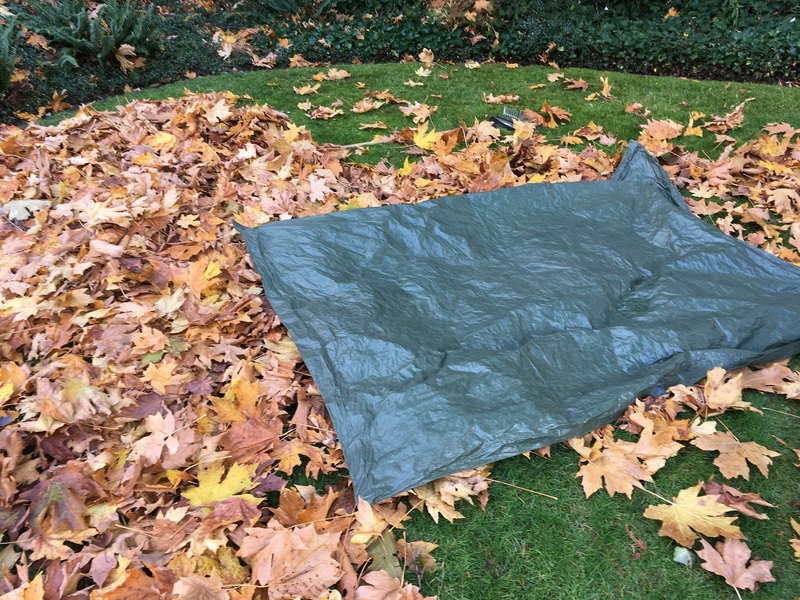 When I handle large leaf piles I frequently put my first tarp right onto the pile. Try it. Don’t be shy. Place your tarp in the pile and stuff it in there. 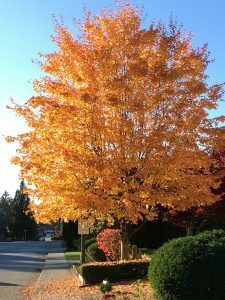 All trees will reach their maximum leaf drop at some point so push through it. 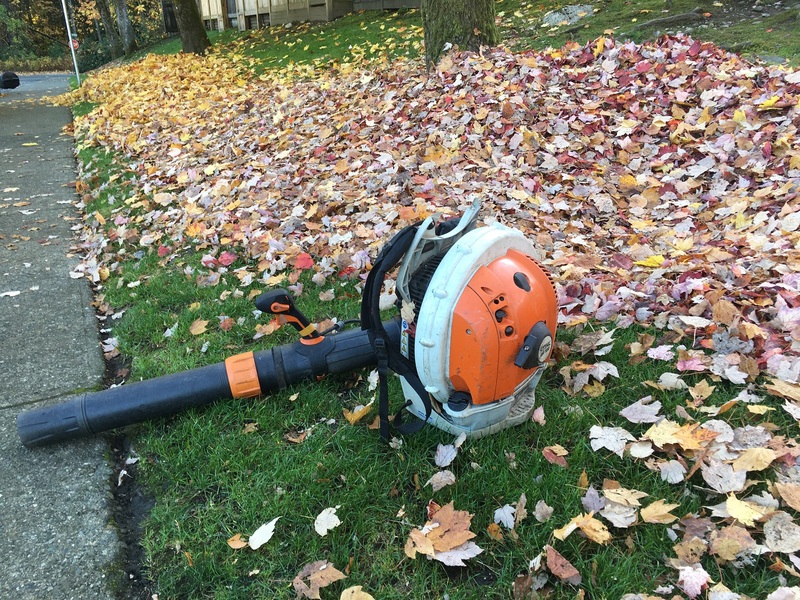 The new Stihl 700 backpack blower is super powerful and perfect for big leafy accumulations. If you can get one, use it. It made a huge difference for us this week. And remember, when you blow avoid pyramids. Create decent looking piles and move on. There are no extra points for beautiful symmetrical leaf piles. It’s a waste of time. 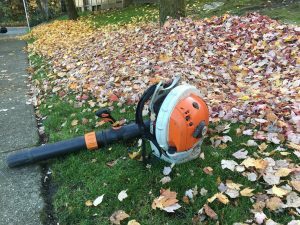 The Stihl 700 blower is a beast. I love it! 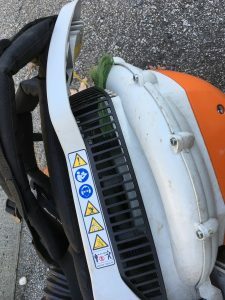 The side panel on most backpack blowers shows warning signs so get to know them well. 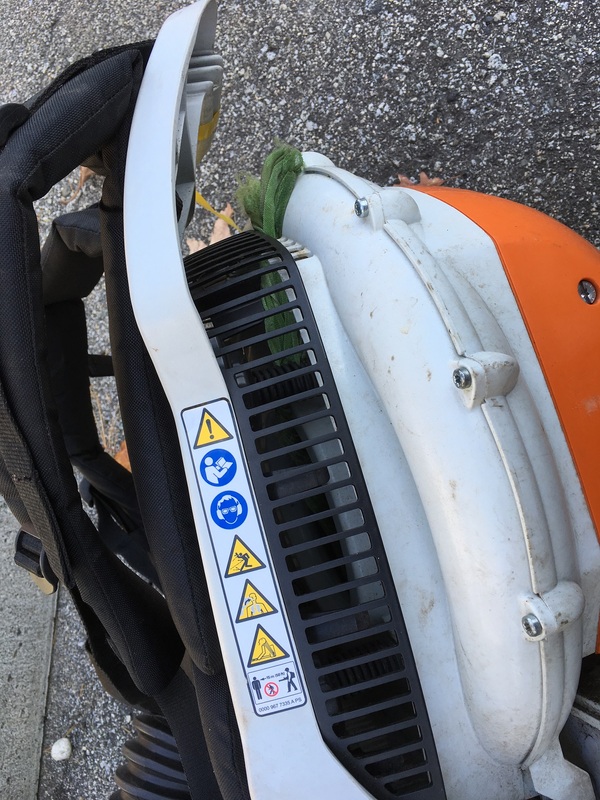 One of them warns us about long hair getting sucked into the back of the blower. Now, I never really worried about this because I never had long hair. I listened to my parents. And now that I am of a certain advanced age, growing long hair is not really an option. But still, you might have girls on your crew and young men who ignored their parents. While blowing a large strata site on Halloween one of our blowers got jammed when a skeleton got sucked into the back of the blower. It was abrupt and loud. God help you if your ponytail gets sucked in. You’ve been warned. Read the warning signs on your blower before you use it. The green fabric used to belong to a skeleton. Once it got sucked in, it jammed the machine. Personally, I love the fall. Once I clean up a leafy site, anything fresh on the ground is fine. It’s fresh so enjoy it. The fall is beautiful.